Well guys, here it is, the contest I was thinking about for some time now. This is the June 2017 contest. The goal is to reach to 10,000 members by the end of May. So, how about this: IF this group will get to 10,000 members before June 1st, I will have a contest where there will be 3 prizes. I promise you that you are not going to be disappointed. So, shall we do it? Share the group, invite and add your friends, do your best and let’s get to 10.000. Each Sunday from now on I will give you more details about the prizes. Trust me, I will be generous about it, the only condition is to get this group to 10,000 by the end of May. So, let’s spread our love for Vintage Citizen Watches! Goal: 10,000 by the end of May. Click here to get to THE VINTAGE CITIZEN WATCHES FACEBOOK GROUP. 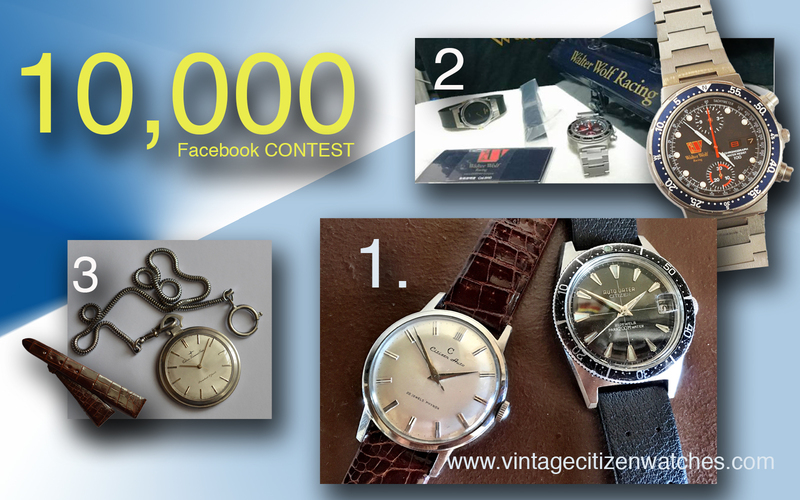 the contest rules (easy & fun) – just post a picture with a Vintage Citizen Watch (or more) in the Vintage Citizen Watches facebook group (in the first week of June). Who gets the most likes by the end of June 7th wins. 🙂 Valid entries are from June 1st to 7th. I will declare the winners on June 11th. TOTAL ESTIMATED VALUE OF PRIZES: over 3,700 USD! I’m happy to have found your Facebook page and that you’ve directed me here. There is a lot to learn about Citizen watches, and I’m reading as much as I can! Thank you for all your work.